Sigma Fasteners manufacturers coated studs to meet major Chemical and Oil Company specifications. Sizes range from 1/2 inch – 3 1/2 and larger. Sigma coated bolts have a two-layer structure of special pretreatment polymer film and under-treatment layer. Phosphate Pre-treatment technique insures the physical performance of product without changing and fluropolymer top coating results in a better performance in resisting chemical and seawater corrosion. SermaGard coating is different from PTFE because of their strong corrosion resistant ability. Xylan can be different per customers request to meet various environmental working conditions. Xyan combined with an advanced treatment technology; the film is thin but is excellent in corrosion resistance which prolongs the lifespan of the product. Non-stick and low friction properties can make-up the torque coefficient which is easy to install and disassembling. Property of chemical & weather resistance make it suitable to various severe environments. Xyaln and SermaGard coatings are the best choice in offshore, oilfield and petrochemical precision equipment against corrosion. Its properties are particularly suitable for surface corrosion prevention of underwater precision equipment including Christmas tree, BOP and pipelines and other parts. Improve Make up and break out torque of bolts. Xylan is a fluoropolymer topcoat manufactured by Whitford Corporation, which in the 1014 and 1070 coatings afford high lubricity (co-efficient of friction as low as .02), and corrosion resistance of approximately 1000 hours(ASTM B117) when applied over phosphate, and up to 2000 hours when applied over electroplating. These are solvent based thin film topcoats. These Xylan products have a maximum temperature ranging up to 500 deg. F. Xylan 1000 and 1400 series may also be applied over other basecoats, for added corrosion protection. The 1400 series coatings by Whitford (typically 1424), are low voc coatings. They have a coefficient of friction of .05 to .10, and a maximum constant operating temperature of 400 deg. F. The corrosion resistance of the 1400 series is approximately 1500 hours, when applied over a suitable basecoat such as zinc electroplating. Sigma Fasteners is a licensed applicator for Sermagard products. 1105 is a ceramic-metallic sprayed basecoat that at 1 mil of thickness or more affords 3000-4000 hours of ASTM B117 salt spray resistance, with an appropriate topcoat. It can be used at high temperatures. It is extremely effective in salt atmospheres. The Sermagard 1105 process involves curing at high temperatures (Minimum of 750 deg. (F) and subsequent burnishing with appropriate blast media to achieve conductivity. Sermagard 1105 contains aluminum flake and Chromate. Sermagard 1280 is a fluorocarbon topcoat, which when applied to Sermagard 1105 basecoat gives superior corrosion resistance and UV protection. 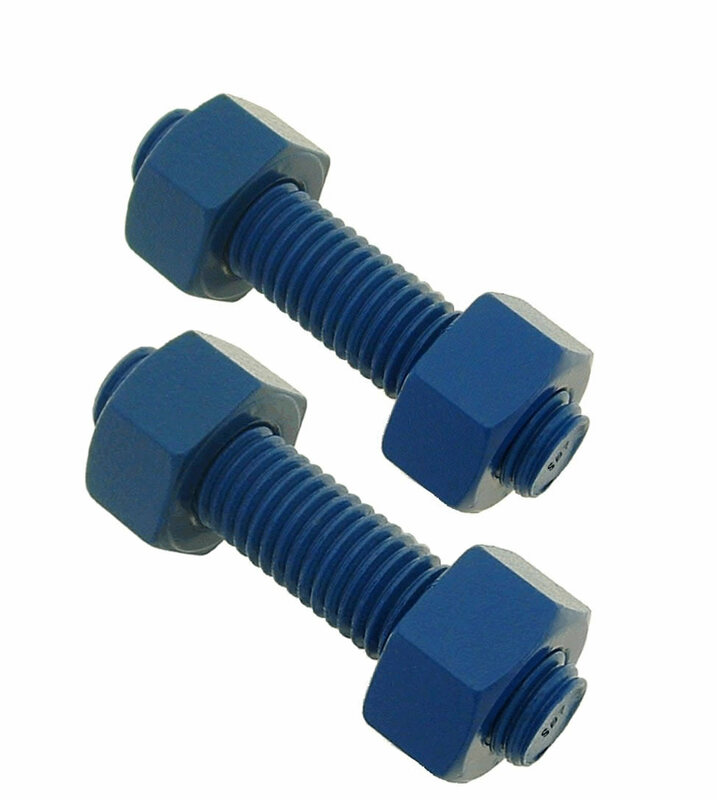 Molybdenum disulfide coated bolts are commonly used to improve the performance in extremes of load carrying capacity, operating temperature and coefficient of friction. This coating provides effective lubrication in a wide range of loads, in many cases exceeding 250,000 psi. Moly coatings lubricate sacrificially by transferring lubricant between the two mating surfaces, which helps to reduce both wear and the coefficient of friction. Moly coatings are a combination of molybdenum disulfide lubricant and high performance resins. The coating is thermally cured to bond thoroughly with the base metal of the coated part. Moly coated bolts can solve problems associated with corrosion, chemical exposure, and abrasion. offer excellent corrosion and chemical resistance and a barrier protection better than phosphate. With Moly’s exceptional barrier protection, it is appropriate for more severe environments and is often used in chemical processing and oil field equipment. Over seventy years ago a DuPont scientist, discovered polytetrafluoroethylene (PTFE) — a fluoropolymer that is corrosive chemical and heat resistance, and the world’s most slippery surface. PTFE Coated Bolts have a Low Coefficient of Friction – The coefficient of friction of PTFE is generally in the range of 0.05 to 0.20, depending on the load, sliding speed, and particular PTFE coating used. PTFE Coated Bolts are Nonwetting – Since surfaces coated with PTFE are both oleophobic and hydrophobic, they are not readily wetted. Cleanup is easier and more thorough—in many cases, surfaces are self-cleaning. PTFE Coated Bolts are Heat Resistance – PTFE industrial coatings can operate continuously at temperatures up to 260°C/500°F. PTFE Coated Bolts have Cryogenic Stability – Many PTFE industrial coatings withstand severe temperature extremes without loss of physical properties. PTFE industrial coatings may used at temperatures as low as -270°C/-454°F. PTFE Coated Bolts are Chemical Resistance – PTFE is normally unaffected by chemical environments. The only chemicals known to affect all PTFE industrial coatings are molten alkali metals and highly reactive fluorinating agents.